Arelatively new boutique in West Omaha is creating jobs not only for the employees but for vendors who just need a place to sell their work. NJ & Co. is run by a duo consisting of mother and daughter. Nicole Leathers handles the business while Jane White, her mother, manages merchandise and displays. Leathers said the store’s demographic ranges from college-aged girls to women in their 70s. NJ & Co. opened their doors in August 2012 sporting six total vendors. Three women go to market and select inventory for the store’s niche while some vendors work there. NJ & Co. illuminates a sense of vintage home décor and repurposed furniture. The fashions are influenced by the different vendors, but there is an underlying retro meets modern look to it all. You can find old-fashioned bird cages for the café or perhaps a frock for a special occasion. Leathers feels West Omaha is a prime location for the store. “I feel like we’re filling the home décor niche,” Leathers said. In fact, nothing at the store is mass produced. More important is what Leathers and White are doing for the vendors. “We provide these women with an upfront entry point where they can learn to succeed without losing money,” Leathers said. The vendors include MOD Boutique, Painted Dog, Twice Nice, Bocachi, Ali Rae’s and Beaded Creations by Marcia. Mod lives by the motto “style is eternal,” so mothers and daughters can shop together for jewelry, tops or leggings. Painted Dog believes in recycling and giving back to the environment; they repurpose furniture using only biodegradable stripping products. Twice Nice also refurbishes old décor and brings the metamorphosis full circle with stain and finishing. Bocachi believes in scouting for old treasures while offering tops, dresses, jackets, accessories and more. Ali Rae offers shoppers tunics, jewelry, scarves and purses. Beaded Creations by Marcia specializes in making interchangeable beaded watch bands. Expect some funk and bling with industrial chic. Opening your own business is always a risk. Leathers was nervous about opening because of the economy, but she finally decided, “to hell with it!” Leathers added that she hopes the boutique draws people away from malls to support local shops. White previously owned seven Hallmarks and some accessory stores in Wisconsin, so the duo had some experience behind them. “My mother’s background made it less scary opening,” Leathers said. NJ & Co. offers “Girl’s Night Out” the first Thursday of every month. The store stays open until 8 p.m. for shopping, snacks and spirited beverages. Shortly before Christmas the store offers a men’s shopping night. Maybe it’s because men wait until the tail end of December to buy gifts. Maybe they have a soft spot for décor. Regardless, men’s night has been NJ & Co.’s most successful endeavor so far. Gift wrapping is always provided, regardless of the day. NJ & Co. is the perfect place for Mother’s Day. Shopping shouldn’t be too hard, since the store merges older tastes with young flair. 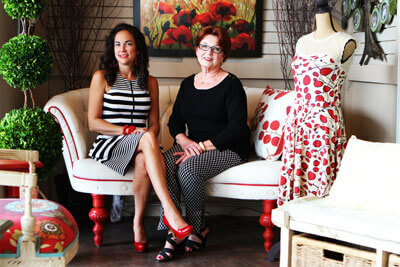 After all, NJ & Co. offers furnishings, frocks and finds. Stop in today at 17650 Wright St., Suite No. 4.